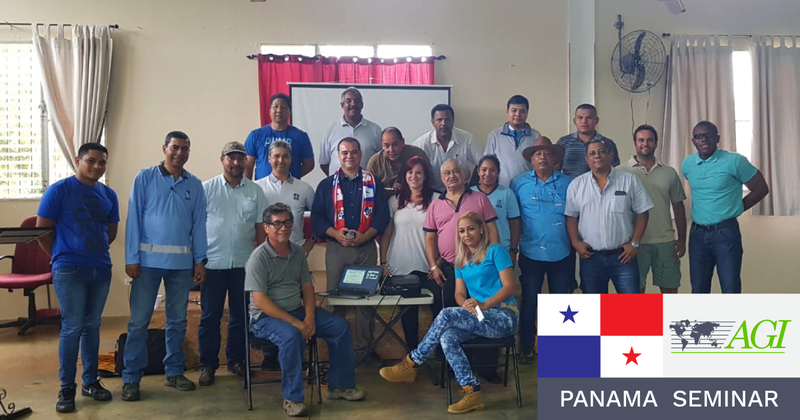 Our very own Eduardo Rodrigues—from our Madrid office—spent a few days in Panama, where he hosted a seminar. One of the great things about our field is that as long as there’s earth, there’s someone who’s interested in surveying the earth. And as long as someone is interested in earth surveys, there’s someone who's interested in Electrical Resistivity Imaging. It’s always great when we get outside of our offices for a little “T&T” (travel & teaching). It gives us a chance to meet others in our field—or thinking about entering our field—face to face. We hold seminars and workshops like this throughout the year so reach out to us if you would like to invite us to your country. You can also check out our yearly seminar schedule for when we hold 3-day seminars at our offices. Actually, our company is no stranger to Panama. Back in 2008, we helped with an expansion of the Panama Canal by using marine resistivity. You can check out that case history, but this time around we were happy to keep our feet on the ground. While we may not have hit the water this time, we covered a lot during this seminar. We covered the majority of survey types—including 2D surface surveys, 2D and 3D borehole surveys, surveys that achieve 3D from multiple parallel 2D lines (or 2.5D surveys), 3D surveys in earth, and even 3D surveys in concrete! You can see pictures of each type of survey below. As with any seminar, we also discussed theory and data inversion. We even ended up surveying well into the night! We really appreciated our group’s enthusiasm and hospitality. We can’t wait to go back to Panama (and other countries) for more seminars like this one!